Another week, another tower defense game. This one is in space, you say? And has an HD texture pack upgrade? And a giant, robo mech that protects your base? Alright, I’m sold. Let’s have a look. When you first open up Sentinel 3: Homeworld, you’ll be prompted to download additional files (19MB worth, to be exact). I get it, it’s a big game so not everything comes bundled in from the Market. There’s also an optional 40MB “HD pack” add-on that’s totally not mandatory, but recommended if you’ve got space to spare and you’re playing on a tablet. There’s three game modes: Campaign, Endless, and Classic. In Campaign, you play through the (cliche and weak) story. You get to control where your mech’s skill points are spent, buy more weapon slots for your ground and sentinel weapons, and buy the weapons themself. Endless mode is just what is sounds like. Endless (natch) waves of bad guys come at you and you try to stave them off until you lose. The Classic mode is similar to the Campaign, except each level has you outfitted with specific towers and such to fend off your enemies. 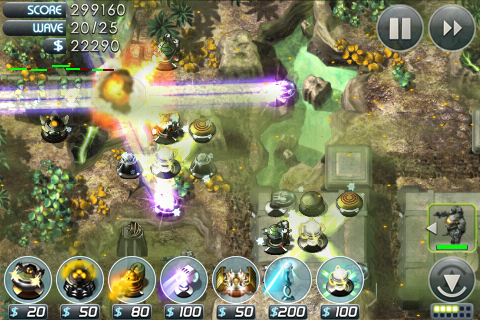 Gameplay is typical from a tower defense game. You put up towers, they kill bad guys, you get money, and the whole cycle repeats itself. Sentinel 3 tries to differentiate itself from the pack with two ideas: the commander and the sentinel itself. The sentinel is your spaceship, presumeably floating in near-Homeworld orbit. As you continue to move through the levels, you’ll be able to purchase new and exciting abilites for the sentinel. I think the first one you can buy are homing missiles that rain destruction upon your enemies. All the sentinel abilities require energy to use, and there’s an energy pillar thing that keeps sending charges up as long as it doesn’t get destroyed. Sentinel 3 is also long. The first level on Classic took me 35 minutes, and that was with the fast forward option turned on. While this definitely promises a lot of gametime for your money, at some point you’ve got enough towers out to know you’re not going to lose, and at that point, it feels like it wouldn’t hurt to set your device down and go for a walk. Still, there is a lot to do in Sentinel 3, between the three games modes, and then two styles withinClassic. Oh, and did I mention there’s four levels of difficulty? And OpenFeint support? Cause there is, and there’s achievements to go along with everything, including things as simple as beating a level. If you’re willing to take the plunge and bring the fight to the homeworld, download links are after the break. Want to have a better diet and more energy?Want to eat nutritiously for better health?